The Universal Pillows is designed for use on all hard surfaces to absorb and contain spills of a wide range of water-based liquids, including paints, pesticides, herbicides, body fluids, and food stuffs. 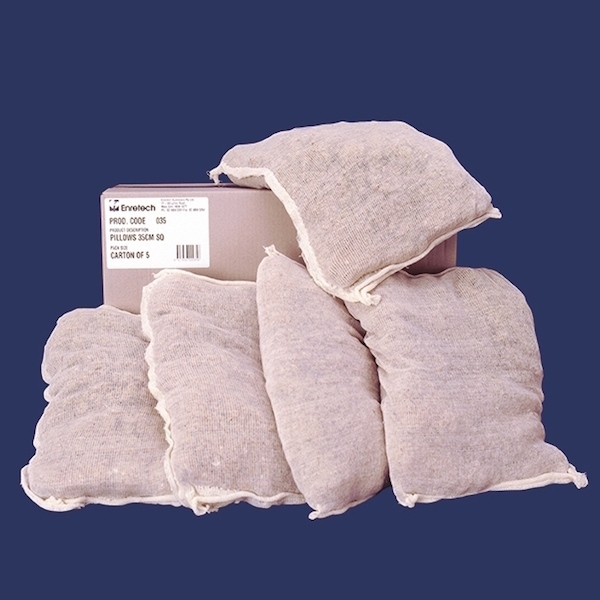 Pillows are for both spill containment and absorption, and they are an environmentally-friendly alternative to synthetic polypropylene products. All Universal Pillows contain a special GP form of our popular XtraSorb, and are contained in a natural, permeable cotton jacket. They are most effective when used in conjunction with KleenSweep and they are an integral part of any spill response system. Cost-effective — get a high absorption rate using a small amount of product means saving money.